Going on a vacation, visiting your family or just taking a small trip on your day off is fantastic, but when it comes to the act of traveling itself, not so enjoyable. Just like many people tend to be stressed and anxious during traveling, whether by car, plane, bus, boat or train, cats are just like them. If you are planning to travel with your cat by plane, you must expect the occurrence of stressful situations. Cats, just like people, have personalities. If you are lucky, your cat won’t have a problem with traveling, but that is a rare case because cats generally don’t like being in a moving vehicle out of their comfort zone. So, when it comes to sedation, the best way to do it is to have your vet prescribe sedation for your cat. Your usually happy and always purring cat can while traveling transform to a cat from hell. Everything that is not familiar to your cat, like loud noises, strangers, new smells and unfamiliar places is stress to her, so airports and plains are a big deal for your fluffy friend. Some cats, like Persian, Burmilla and Scottish Fold cats, could get health problems while traveling on a plane because these cats have flat faces and tend to have breathing issues what can get worse while flying due to their limited airways and the stress. If you don’t want anything bad to happen to your cat, you have to make sure that you plan everything in advance, especially if your cat is air traveling for the first time. You are surely not able to predict how your cat is exactly going to behave, but you can do some things in order to make the travel experience for your cat more enjoyable. With the right preparation, your furry friend will arrive at the destination safe and sound. The following guide will help you make the right choices when it comes to preparing your cat for the flight and also give you pieces of information about what airlines allow pets. 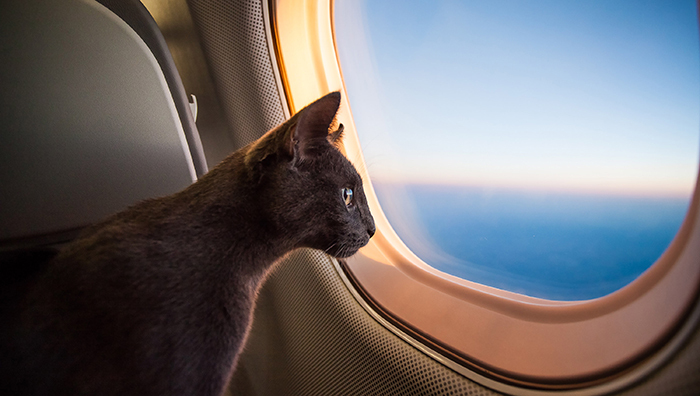 If you are planning to fly with your cat or cats in tow, you first need to choose an airline. When it comes to airlines, you need to know that not all air companies are pet-friendly and that every airline has their own rules when it comes to traveling with a pet. Some airlines do not allow traveling with a pet at all, while some of them allow traveling with a pet just when you are taking them to a competition or cat pageant. Also, many airlines have restrictions like how much your cat can weight, what sort of cat you are allowed to bring, how many times you can travel with her, can your cat be in the cabin with you or must she be in the cargo, how much paperwork you need (like medical records and passport) and what vaccinations you cat needs before traveling, etc. So, before you choose an airline, you need to know everything about them. Here is a list of airlines that are pet-friendly and some of the rules they have. United Airlines allows certain sized domestic cats to travel accompanied in the aircraft cabin on most flights within the United States. Note that your cat must be older than 8-months. The price of a flight in each way is $125. They don’t just allow the pet, they also allow a carry-on bag, which is unusual. For cats that are restricted from cabin travel, United Airlines offers PetSafe, which includes plane compartments pressurized in the same way as the cabin, airport-to-airport delivery for animals and also features a 24-hour live animal desk what gives owners the ability to track the cat all the time. Jet Blue is the leader in the pet travel airlines. Jet Blue charge a pet fee of $100 each way and allows one pet in a carrier per passenger because the cat and the cat carrier are considered to be carry-on luggage. The cat, together with the carrier, cannot exceed 20 pounds, and the carrier itself can’t exceed the following dimensions: 17 inches long x 12.5 inches wide x 8 inches high. Jet Blue’s JetPaws program includes a special bag tag for the cat-carrier and unlikely most airlines, they allow you to book the flight for your cat online. Also, pets are allowed on all Jet Blue domestic and international flights, except to Jamaica, Barbados, Cayman Islands, Saint Lucia, and Trinidad and Tobago. According to their website, all cat breeds are allowed on the airplane. A big plus when it comes to Jet Blue airlines is that they sell their own branding and approved carriers and other travel kits, as well as publishes a checklist for flying with your pets. WestJet allows you to travel with your cat in the cabin, counting towards your carry-on baggage allowance or as checked in baggage. WestJet is one of the cheapest airlines for pet travel because they charge a fee from $50 to $60 in each way if they are carried on and a $75 to $90 if they are part of the ”checked baggage”. This airline allows up to 100 pounds for the pet and the carrier combined. In addition to that, one passenger can check up to six pets, what makes WestJet ideal when you are traveling with more than one cat. The cost of the flight with Virgin Atlantic airlines depends on the combination of the size of your cat and her travel box. Virgin Atlantics also requests a call to their shipping department to discuss the pets before you can book the tickets. Pets are accepted in the aircraft cabin, counting as the carry-on bag allotment, and in the baggage and cargo compartments. All pets that are traveling in the cargo have to need a health certificate dated within 10 days of the outbound departure date. Alaska Airlines has a climate-controlled baggage and cargo compartment. This airline also offers Pet Connect animal travel for pets who are traveling without their owners. Pet Connect offers free pet health examination and discounted health certificate. Allegiant Air allows domesticated cats and dogs and only allow pets to be carried on the plane and kept in the cabin, not checked in in the cargo hold. For this, Allegiant Air charges a fee of $100 in each way, which is pretty low considering that this airline is known for their high ancillary fees. When it comes to pet travel, American Airlines has heavy restrictions on the types of pets that can fly, however, cats are allowed. On American Airlines only cats and dogs are allowed to be in the cabin with you except for flat-faced breeds. Cats cannot fly in the cargo hold because of the lack of climate control system. The temperature limit is up to 85 degrees Fahrenheit at any point of the journey, so to avoid complications your cat must be with you in the cabin. For flights within the United States, the fee for bringing a pet in the cabin is $125. On long international flights, pets are not allowed in the cabin, but this depends on the duration of the flight. Delta Airlines is more moderate when it comes to bringing pets on board. It is allowed to bring your cat, except it is a flat-faced breed. When it comes to aircraft restrictions, only two types of aircraft are not permitted to carry animals in the cargo hold, these two types are Boeing 767 and A330-200, on all other aircraft pets are permitted to fly in the cargo hold. Also, Delta airlines restrict numerous pet travel to numerous countries and do not allow pets in the cabin when flying to China, South Africa, and the United Kingdom. If your cat is an emotional support animal, you will also need to bring advanced documentation stating the need for the animal from a medical professional. Delta Airlines charges a $125 fee for cats traveling on domestic flights and $200 for international flights, but if you are traveling to Brazil, the fee will be only $75. The Florida-based carrier has a slightly restrictive pet travel policy. The airline allows flying with your cat, except when flying to US Virgin Islands and Puerto Rico, and you cannot fly with your pet internationally. Pets are allowed only in the cabin. Pet travel with Spirit Airlines is subjected to a fee of $110 per flight. Southwest Airlines have a moderate pet travel policy. The airline limits pets on board to small domestic cats and dogs, who must be vaccinated. Pets are allowed to fly in the cabin of any Southwest aircraft, but not in the cargo hold of the plane. Pets are restricted to domestic flights, so you can’t fly with your cat internationally. Also, Southwest Airlines sells their own branded carriers for $58, and the flight for your animal costs $95. We recommend you to doublecheck everything you need to know with the airline company you have chosen in order to avoid some misunderstanding. Also, if you are flying internationally, you need to know if the country you want to go to allows you to bring your fluffy friend because not all countries allow you to do so and many countries have their own rules when it comes to animals. If you are going to travel with your cat for the first time you need to make sure you buy the right kind of cat carrier for the plane. The dimensions and type of the carrier depend on the airline you have chosen. You will have to inform yourself about what type of transporters are allowed in the cabin. The place under your seat in the airplane will determine the size of the transport carrier, so you need to ask the airline to provide you with the precise dimensions under the airline seat. You should also check with the airline company if you can get a soft-sided or hard-sided carrier. Most airlines will accept both soft and hard-sided carriers, but some airlines will require a certain kind. We recommend soft-sided carriers because they are easier to slide and fit under your seat. Some airlines have their own brand, so you do not need to worry about what brand to buy. If you don’t want your cat to be under the seat during the whole flight, you should consider booking your cat their own seat. But, before you spend the money, make sure with the airline if that is allowed. Also, if you have more than one cat flying with you, and the airline accepts just one, you can ask a friend to fly with you so you can take two cats. Once you bought the right carrier for the flight with your cat, it is time to get her used to the carrier. We recommend you to buy the carrier at least one month before your booked flight so that your cat can become used to it. Getting your cat used to the transporter can be difficult, so here are a few tips and tricks to trick her into the carrier. An important thing when it comes to getting your cat used to the carrier is not to force her to get in. Cats are not like dogs. Dogs will always listen to you because they are more submissive than cats. Cats do what they want to do. 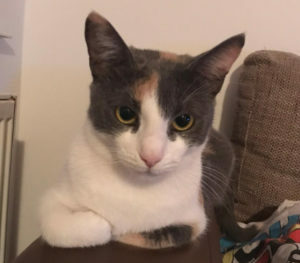 You surely have experienced that situation when you call your cat in order to come to cuddle with you, but she just looks at you and goes her own way. Cats are independent lifeforms, and you can’t expect from your cat to do what you want. So, the first step will be to let her on her own get in the carrier. Cats are natural explorers, and they will sniff and touch every new thing in the house. When you come home with the new carrier, introduce your cat to it, by just placing it on the floor. Like all cats, she will sniff it, touch it and even take a nap in or on it. By letting her explore the carrier on her own, the first part is done. The second phase in getting your cat used to the carrier is to encourage her to get in and out. It would be good to put some of your cat’s favorite toys in the carrier and to feed her in it, by doing this, your cat will associate the carrier with a positive activity. Also, practicing with your cat to go in and out the transporter is a good preparation for the airport security checks you will go through. Because you can’t know how your cat is going to behave in the transporter outside the house, it would be good to go for a walk with her in the carrier. The first time leaving the house will probably not be a lovely experience, as for you as for your cat, but it will be better with every next walk. The first walk should be as short as possible. When you see your cat had enough, go back home and after every walk give her a reward for her good behavior. Both, you and your cat will benefit from the walks, you because you will know what to expect during the flight and your cat will be a little calmer. 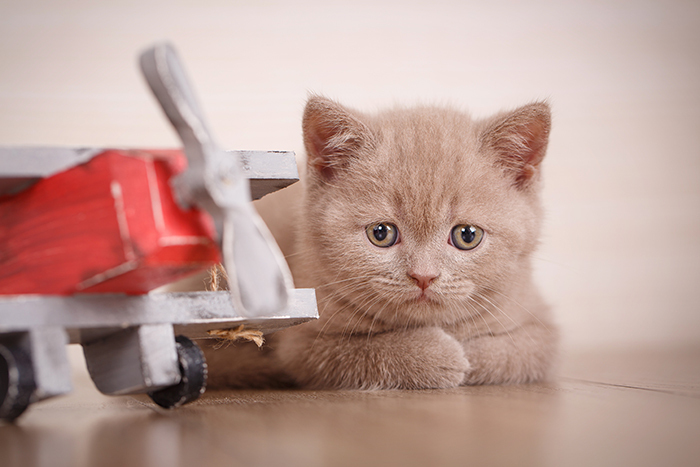 Worried your cat will make a mess? If you are worried that your cat will be scared and ”make a mess” in the carrier during the flight, you can line the transporter with absorbent potty-pads. So, if your cat makes a little ”accident” on the airport or during the flight, the potty-pads will soak it all up. It would be wise to carry some extra pads, zip lock bags, paper towels, and gloves with you to be ready for cleaning and contamination of the ”accident”. If you are not so sure about the efficiency of the potty-pads, you can also buy a portable litter box. No matter the duration of the flight, your cat will need to use the litter box at some time, so you can’t go wrong with buying the potty-pads and/or litter box. We recommend you not to feed your cat on the day of your flight. If your cat is ”stuffed” with food before your flight, there is a good chance that your furry friend will make a ”mess” before you even arrive on the plane. Some cats tend to get stomach problems during the flight, so by not giving her food a few hours before the flight will limit the risk of vomiting and nausea on the plane. You can bring some food for your cat with you in case she gets very hungry at the light or, if your beloved pet is in panic, you can give her food to distract her from the actual problem. If you are planning a long flight or if it includes layovers make sure to give your cat small amounts of food and water. If you don’t have a harness for your cat, you should get one before your flight. At the airport, your bags and other languages must go through the x-ray screening device, so must your cat carrier. Even though everything will be screened, your cat will not, so you will have to get her out the transporter at the airport. Because you will have to carry your cat thought the human screening device, and your cat will surely try to escape from your arms, you should attach a harness with a leash on your cat to avoid her running away from you. So before you put the cat carrier in the bin to go through the x-ray, prepare yourself and your cat. Also, you should put a luggage tag, your name, current address, telephone number and your final destination on your cat’s carrier to help it identify if it gets lost in transit or at the airport. 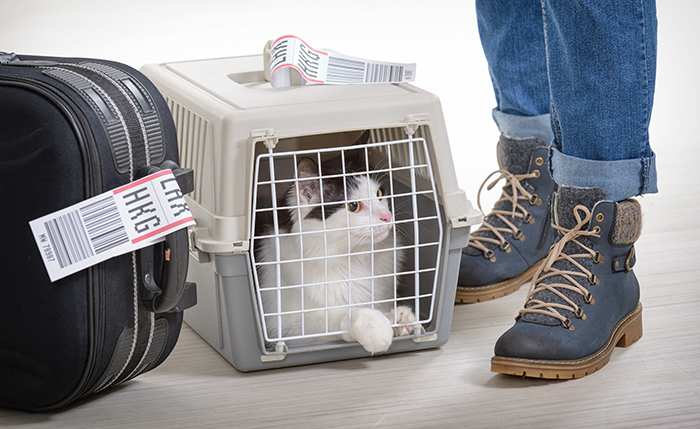 Before you go on a flight with your cat, you must take her for a check-up to a veterinarian. Every air company requests a health certificate from an approved veterinarian. How many papers and check-ups you need to do with your cat before the flight depends on the airline and also on the final travel place. If you are traveling in the United States, you probably will not have that many check-ups to do, but if you are going on a flight with your cat internationally, you will need much more to do. Talk to the airline about every check-up you need to do and in what time it should be done because some health certificates are valid for just 10-days. Be sure you are informed about everything you need to do before the flight. The veterinarian can check your cat’s overall health. If you have not visited the veterinarian for a longer time, it would be good to ask him, or her, to do a total health check-up on your furry friend. Also, when you are already there, you can ask your vet to renew any prescriptions for medications if your cat is taking some, so you don’t have to worry if the medication prescription will expire. You could also ask the veterinarian to check and treat your cat for fleas and ticks. The treatment for ticks and fleas is required if you want to visit a foreign country, and it is good for your cat too. If you are worried your cat will fall in total panic at the airport, or on the flight and start to scratch you and the transporter, it would be a good idea to cut them off before the arrival on the airport. So if you are too scared to cut your cat’s nails, you can ask your vet to do that. If your cat does not already have a microchip, your vet can microchip her. Some people are not for microchipping your pets, but this is very important for pet identification, and also many foreign countries require from you to microchip your cat before entering. In the chip manufacturer’s database will be information like your name, your cat’s name and address, so that if your pet gets lost, you can find them. Because many airlines and foreign countries require a complete health certificate your vet can complete them, and he can also verify that your cat’s rabies and other vaccinations are current and issue a vaccination certificate. If your thing your cat will be in panicking the whole time on the flight, you should ask your vet to prescribe you sedation for your cat. Giving your cat sedation is not recommended, but if your cat is stressed and anxious during travel, you can give her sedation in order to avoid hearing sad meows during the whole flight. So, now you know that what you all need for the flight, and how to properly prepare your cat and yourself for traveling, it is time to talk about the actual flying part. After you have done the whole job with choosing the right airline, booked the tickets, buying the carrier for your cat, took your cat to the vet and have done all the needed paperwork for the flight the time has come for traveling. Your cat will probably be scared and anxious during the flight. No cat likes unfamiliar and crowded places, strange smells and loud scary noises. At the security checks at the airport, she will maybe try to escape, so prepare yourself for her trying to ”wiggle” out of your hands. 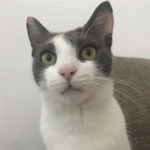 Your cat will maybe, at some point start meowing, that is her try to signalize that she is scared, don’t worry about that because it is totally normal, at some time she will stop. She will, maybe, try to escape from the transporter. You will see her trying to dig a hole in the carrier. If your cat falls in total panic, she will maybe make a ”mess” in the carrier. After the flight, when you arrive at your final destination, she will probably be angry at you, so prepare some yummy food for her to make her forget about the ”horrible” thing you have done to her. Here are some tips on how to help your cat to have a less stressful trip as possible. Before and during the flight try to be calm. If you are scared or worried, your cat will notice that. Cats know how you feel, you know what we mean, like when you have stomach pain, and your cat comes to you, leys on your stomach and starts purring to make you feel better. So if you are scared, your cat will notice that something is wrong, so she will start to feel stressed as you are. On the other hand, if your cat sees and feels that you are calm, she will get calmer too. During the flight, you should talk to your cat. If you talk to your cat, she will feel more comfortable. You can bring a toy with you on the flight and play with her, and talk while you are playing. By playing and talking to her, you will distract your beloved feline from the flight. Now you have almost everything you need to before and on the flight. Even with all this knowledge, you can’t have much influence on if the flight will go smooth or be a catastrophic experience, the influence has your cat. Every cat has an own personality and temperament, so it all depends on the cat. If you are lucky, your cat will not have a problem with the flight. Some cats will just eat, sleep and be happy on the flight, while others will make problems. Because you know your furry friend the best, feel free to add some of your own advice and experiences to the mix. You surely will know the best method od to keep your cat calm at the flight. We wish you a happy flight and hope that we have helped you to prepare your cat for it. Do you have any experience with cat sedation? Have you tried any other methods to calm you cat for travel? Let us know in the comments bellow.